You know why I'm here today, right? No, no, no - not purely to nag you about voting in the second round of Gallery Idol 2011 (though please do feel free to pop across and vote of course - check out #14 LOL!) , but to share a super new CASE study. Right then, you know the deal by now: be inspired by Dawn's creation and show us what you've got! Whether you're a beginner or super experienced we welcome you with open arms to come and join in the fun! Thank you so, so much for popping by! I'll be posting here tomorrow with a super fun post that you may wanna check out...I can't tell you any more than that! My lips are sealed! Your mojo is definately still in action Aimes! Love the addition of the ribbon and buttons. 6 weeks or 7 of playtime ahead! 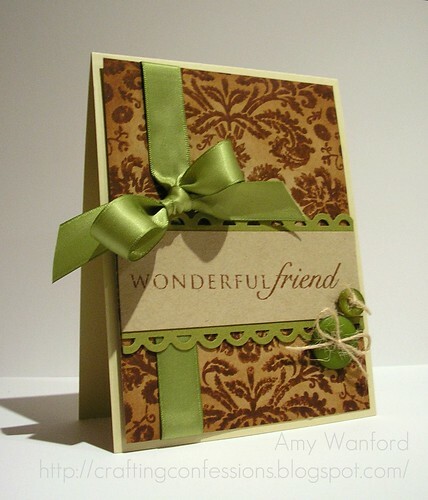 This is gorgeous Aimes - I so do need to get myself that stamp. Every time I see you use it it think "gotta HAVE that!!" Good luck for tonight too (got everything crossed for you). Happy, happy summer days to you Aimes! And stop apologizing about your card...it is AMAZING! Your card is amazing. And you are amazing. And....have fun a happy summer! Super fabulous card Amy! I love the colors and all of that inkiness! I dunno, I think your mojo may have made a sneak appearance for this card, cuz I'm lovin it!!! :D the ribbon and scalloped border and buttons, all perfect embellies for the fabulous background stampin! Ewwww.... Amy I love this! That green bow is FAB!! A gorgeous card for sure! Happy summer to you!! OMG Aimes, I wish I had some of your mojo - your card is FANTASTIC!!! Fabulous earthy colors, glorious green especially...that olive bow is just fantastic! Your card is so beautifully elegant...I love it! Lack of mojo??? You modest thing you! This is nothing short of fantastic. The earthy color palette, the texture, the composition. Pure fabulous-ness! I'm sorry for being late commenting (on this one nd in general lately)... I've been chasing my own tail! Stunning card! I love this color combo! !